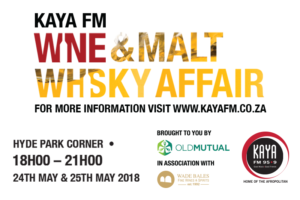 The highly anticipated Kaya FM Wine & Malt Whisky Affair is happening in May this year. This annual experience, hosted at the stylish and sophisticated Hyde Park Corner and now in its seventh year, delivers the ultimate in indulgence for the distinguished Afropolitan. 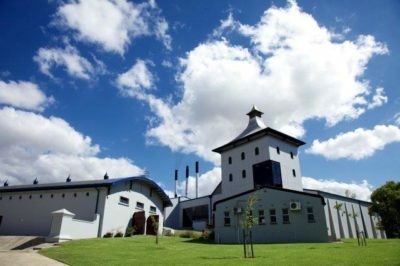 The event showcases sought-after, limited release wines and rare malt whiskies from around the world. “Staying true to our previous events, we have handpicked a selection of interesting and distinctive wines and whiskies, which are all available for tasting. What makes this event unique is not only the range of premium products, but also the calibre of the passionate and knowledgeable people who present them,” says Wade Bales, well-known wine and spirits matchmaker. Over and above the 200 wines and whiskies available to taste, guests will again enjoy the Half-Time Bell mid-way through the evening. 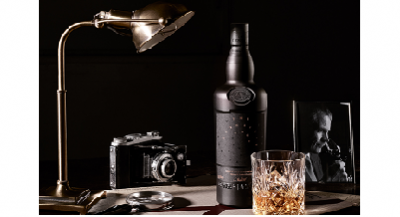 For a limited period of 15 minutes, they will have the opportunity to taste extremely rare and limited editions of wine and whiskey from “under the table”. According to Ntombi Tisani, Head of Marketing at Old Mutual Personal Finance, the event brings together Afropolitans who appreciate the finer things in life. Creation Sumac Grenache 2016: inspired by nature and meticulously crafted by cellarmaster Jean-Claude Martin, each single-vineyard wine is the ultimate expression of its terroir and a multi-faceted artwork in its own right. Allocated 92 points by Jamie Goode, renowned British author and wine connoisseur. Delaire Graff White Blend 2015: the exclusive Icon Range is produced from the estate’s finest single-vineyard wines and select blends. Awarded a Five Star John Platter rating as well as 93 points in the Tim Atkin Report 2017. Vilafonte Series C 2015: a wine that is usually sold-out in the first six weeks. Scored Greg Sherwood MW (UK) 96 points, with previous vintages being voted as TOP 100 International wines. Bruichladdich Black Art: the fourth release of a unique and pioneering cult cask exploration series. 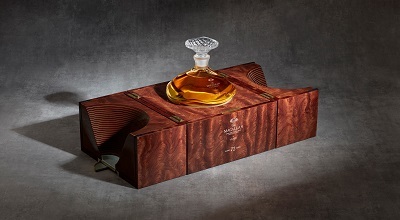 The Macallan Rare Cask: crafted to showcase complexity and depth, Rare Cask is drawn from the broadest spectrum of casks, 16 different types making it a limited and very rare whisky. Midleton Premium Irish Whiskey: each vintage differs, and is only released in very limited quantities, with each bottle individually numbered and signed by the Master Distiller. Ardbeg Corryvreckan: takes its name from the famous whirlpool that lies to the north of Islay, where only the bravest souls dare to venture. 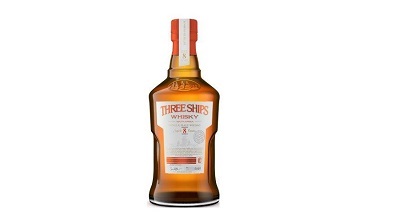 Awarded The World’s Best Single Malt in 2010 by the World Whiskies Awards. Engage with the winemakers and whisky aficionados, who will share their unique insights into the secrets of the grape as well as the golden dram. Old Mutual will also host an exclusive lounge where guests can connect and access great advice. Limited Early Bird Tickets are available at R195 per person and once sold-out, Full Price Tickets will be R290 per person and include all wine and whisky tastings, a complimentary glass, and a selection of gourmet cheese, antipasti deli and artisanal breads will be on offer for the guests.